Our run of unbelievably nice weather continued this weekend – I think the weather these past few weekends has been better than the rest of the summer combined. Having been away so much, Saturday was relegated to running around and doing some long-overdue errands. Sunday I had planned to do a “county walk”. A few weeks back on one of my trips I was hanging around the airport, and picked up a book called Walking in Britain. It has all sorts of interesting walks, from short day trips to multi-week trips. Since I knew Sunday was going to be nice, I picked one, a 10-mile/16 km walk from Bath to Bradford Upon Avon. I really like Bath, and this looked like a pretty easy-to-follow first attempt, as it followed the Kennet and Avon Canal the whole way. I caught the first train of the day out of the Paddington train station, and headed west. The day wasn’t too promising to start with; a thick blanket of fog covered everything, all the way to Bath. Fortunately, as I arrived in town and started walking into the town center, the day started to warm up, and the fog started to burn off. 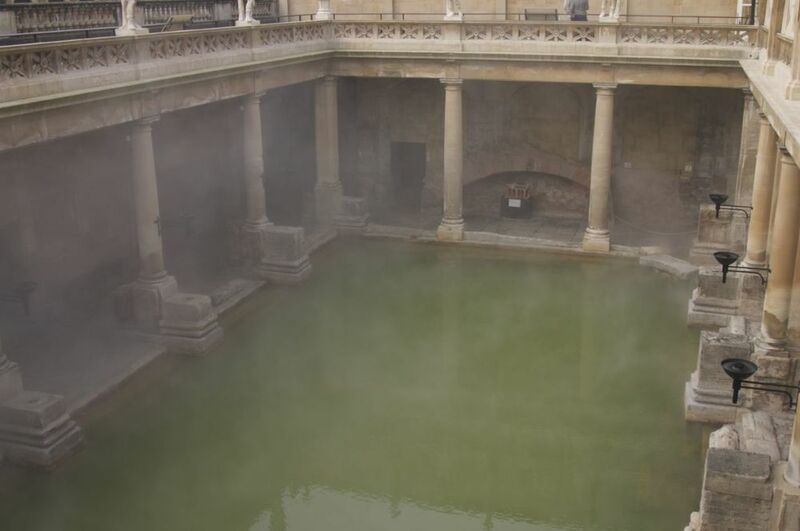 The main place of interest in Bath are the Roman Baths – apparently the best preserved Roman Bath complex in the world, built during the first century AD when the Romans occupied Britain, and Bath was known as Aquae Sulis. It was about 9:30 a.m. when I arrived in Bath, which meant the tourists hadn’t arrived in full force just yet. Making the best of it (and since it was a bit foggy still) I headed into the baths. The place is pretty cool – they have done extensive renovations to expose the Roman ruins, and in fact much of it is in amazingly good shape. The original hot spring (the sacred spring) that drew everyone to the place is still pumping out 1.1 million liters a day, and from the spring the Romans created a sophisticated series of drains that filled the main bathing pool, a series of smaller baths and then flowed off the excess into the River Avon. The amazing thing is that all of the original Roman “plumbing” is still exactly as they designed it, and still functioning 2,000 years later. Somehow I don’t think the plumbing in my flat here will be working in 50 years, let alone 2,000. The archeology work around the baths also uncovered the remains of a very large temple, and the museum contained an interesting collection of pieces of the temple, art and decorative items, coins, mosaics and all kinds of other artifacts. The had a couple of excellent scale models of the site at various points in it’s history. Of course that was all secondary to the baths themselves. While the main baths were very cool to see, I was most impressed with some of the surrounding rooms, that would have been change rooms, used for massage and the like. They actually built raised floors, and did a form of under floor radiant heating to heat all the surrounding chambers. I think I spent about an hour +/- in the baths, then the tourists started coming in droves and I had to leave. I exited into the main street, to the fog having lifted completely and an amazing, sunny day. The Bath Abbey sits right next to the Roman Baths, so I spent a little bit of time checking it out. As it was Sunday morning I assumed a service was on and didn’t go inside. After leaving the Abbey, I walked over to the river, and along the riverside to the Pulteney Bridge. This very cool little bridge over the River Avon has stores along it and links the center of town with the east side of town. From there, I walked up through the center of the town, and was constantly amazed with the architecture. Bath is a Georgian town, and the area is known for the honey-colored stone that the buildings are made from. There are many huge, impressive rows of townhouses. The best example of that were the building on the Circus, supposedly a departure for Georgian architecture, and the Royal Crescent, called the “most majestic street in Britain”. Not sure about that really, but it is a very impressive street. And very difficult to photograph properly. I really like Bath, but touring Bath wasn’t my primary objective for the day, and I had a 10-mile walk ahead of me. I headed back to the train station, which was my starting point for the walk. As mentioned, the walk followed the Kennet and Avon Canal, a man-made canal built to link London and Bristol, before trains and cars made the movement of goods as easy as it is now. The impressive thing about the canal is that other than the locks through towns, it pretty much follows a high route through the countryside, which necessitated the building of a series of large aqueducts when the canal had to cross the river. More about those later. It seems that once trains made the canals less-then-efficient for moving goods, they fell into disuse for a long time. Then a number of enthusiasts got together to save the canal, and they were re-born for leisure purposes. Now the narrow boats are used for leisure, and you see tons of people cruising up and down the canals. Plus the fisherman, walkers, cyclists, kayakers etc. etc. – it’s a god thing they saved them. My walk took me out of Bath along the canal, past a series of manual locks. Pretty soon I was out in the open countryside. For the first couple of miles, the path was pretty busy, but soon things quieted down. At Bathampton, there was a very cool pub on the side of the canal, but it was way to early to stop. The countryside unfolded before me, a nice mix of farmland, small woodlands and open spaces. There were few roads or other man-made intrusions, and the river Avon wound it’s way along side the canal in many places. The weather was amazing – sunny and clear, with a hint of a breeze and I thoroughly enjoyed the walk. In places, it got busy again, but for the most part I had lots of open space and solitude. It was exactly what I was looking for, after the insanely busy past couple of weeks. The first major point of interest was the Dundas Aqueduct, the first time the canal passed over the river. I went down to the bottom of it to get a sense. It’s pretty cool to see the narrow boats going over the aqueduct. Near the aqueduct, there was an offshoot canal that was use for moving coal back in the day, and I followed it for a while to this very nice little café, where I made my first stop for refreshments. It wasn’t a long stop – too may people – and soon I was on my way again. The canal made its way through some very nice woodland at this point. Pretty soon, I came to the Avoncliff Aqueduct, and even bigger aqueduct than the Dundas. You had to go under this one to get back onto the path. What do you know, there was another pub at this point, and it only seemed right to provide the local proprietor with some business. I had a quick pint, and decided to push on. It was only another 1.5 miles to Bradford Upon Avon, and I figured I would get a late lunch once I was there. The rest of the walk in to Bradford Upon Avon was pretty uneventful. Very nice, but quiet. Just outside Bradford is the medieval Tithe Barn, part of the original Abbey that was on the location back in the 1300s. The dated some of the wood in the barn to the late 1390s, and figured the barn was built in the mid 1400s. The thing is huge – they figure the roof weights somewhere in the range of 100 tons (all stone). It’s an impressive site, considering how long ago it was built. And it was a functioning farm all the way up to the 1970s, before they turned it into a Heritage Site. I poked around the barn for a bit, then headed into Bradford. In Bradford I enjoyed the balance of the afternoon sitting on a patio of a pub, had a pint or two and some lunch. It was a good day. To get back to London I had to take the train to Salisbury, to change for a train to London. This gave me an hour, and given how nice the light was at the end of the day meant I had to quickly run over to the cathedral to take some more pictures. I got my train, and was home by about 9:00 p.m. It was a long, very good day – I think I’ll do more of these walks if the weather behaves. 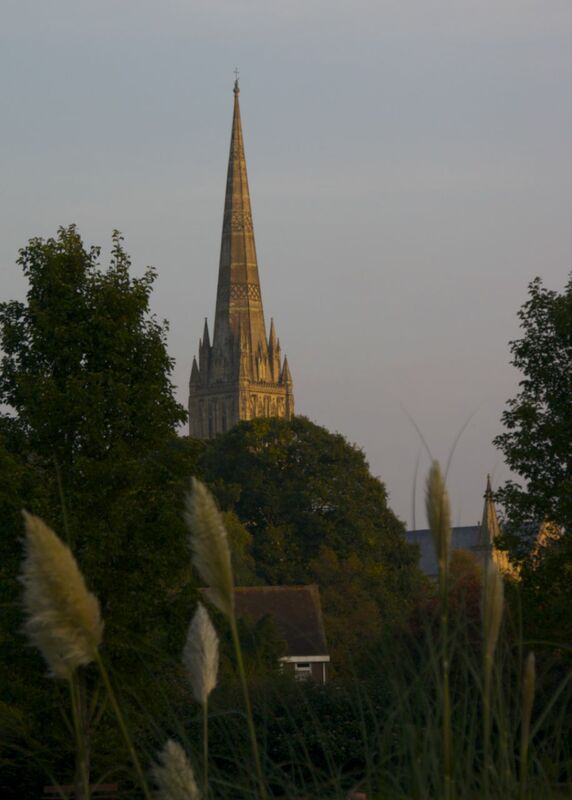 Salisbury Cathedral, in very nice evening light.